Jordan is becoming an increasingly popular place to visit for a walking holiday and with very good reason, as its desert landscapes are truly spectacular and provide a wilderness experience like no other. Another attraction of hiking in Jordan is that you can visit some amazing historical sites as you walk, including the breathtaking city of Petra. Also known as the Red City, this was once an important stop on the trade routes from east to west, although much of its charm for travellers lies in the fact it remained undiscovered by the western world for centuries. We’re going to take a look at some of the highlights of a trekking tour in Jordan – if this interests you, Explore Worldwide can help you organise your ideal holiday. 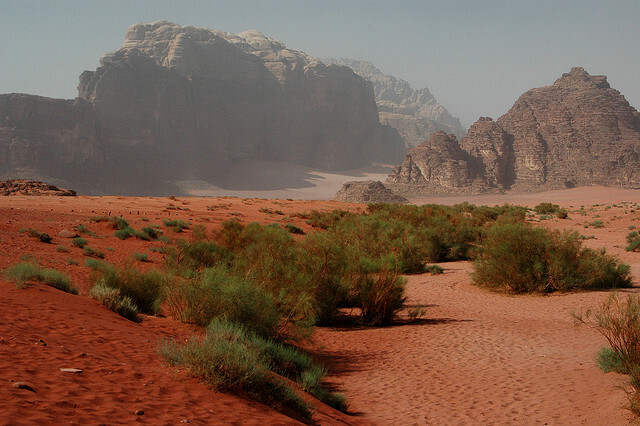 Wadi Rum is a desert valley where you’ll find some incredible rock formations and beautiful scenery. The cliffs and rocks here have been carved into bizarre shapes by the power of the wind and they really are a sight to behold. This part of Jordan was made famous by TE Lawrence, who was based here during the first world war and who went on to write about his experiences. He described the landscape as “vast, echoing and god-like”. However, Wadi Rum was being used centuries before as a trade route and it’s one the local Bedouin people know well. They still live a semi-nomadic life in the desert and visiting one of their camps will give you an insight into how they survive in what seems to be such an inhospitable environment. Among the most famous – and impressive – rock formations in Wadi Rum are the Seven Pillars of Wisdom, a towering red-stone cliff, and the Burdah Rock Bridge. Dotted throughout the valley are thousands of petroglyphs and inscriptions that indicate that the area has been inhabited by humans for centuries. Petra is Jordan’s most famous tourist attraction and with very good reason. This UNESCO World Heritage Site is quite incredible, with the original city having been hewn out of the cliffs and other buildings developed around it in its sheltered location among the mountains. It was the Nabateans who developed it into a thriving hub for traders crossing the desert from the Orient to Arabia and it was a bustling city until the Roman era, when trade routes were diverted and Petra gradually lost influence. Despite being known to the local Bedouins, it was forgotten by the rest of the world until the early 19th century when Swiss explorer Johann Ludwig Burckhardt stumbled across it. Although many of the buildings were in ruins, the tombs and chambers that had been carved out of the cliffs themselves are still in remarkable condition. One of the highlights is the Treasury, which greets travellers as they enter via the Siq Gorge. Obelisks, temples, tombs and a Roman-style theatre are some of the other things you can discover as you wander around the city. If you’ve got the energy for a bit of a climb, make your way to the Al Deir Monastery, which stands at the top of a flight of 800 steps that have been cut out of the rock. In addition to the archaeological treasures themselves, there are two museums onsite that have been designed to give visitors a better understanding of Petra’s history, as well as to showcase artefacts that have been recovered here.